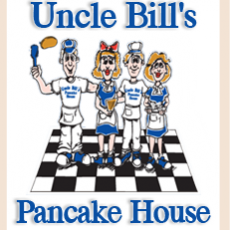 Established in 1962 in Stone Harbor, NJ, Uncle Bill's Pancake House has become an annual tradition for many families visiting the Jersey Shore. Based on the principles of good quality food, great service and a clean family-friendly atmosphere, Uncle Bill's serves up thousands of pancakes per day in the summer. We believe quality starts from the ground up, using only the finest ingredients and the freshest produce from local farmers. Breakfast is served all day with over 15 different types of pancakes, waffles, french toast, fabulous omelets, farm fresh eggs and meats. Several locations also serve lunch and dinner. Uncle Bill's staff and customers return year after year, a testament to our continued success as being the Best Breakfast at the Jersey Shore. Please visit one of our eight locations spanning the South Jersey shoreline. We would love to serve you on your next visit to the shore!